The work of Tarek Atrissi Design has gained many international awards and has been honoured in several occasions. Our awards include the TDC (Type Directors Club New York); The Adobe Design Achievement Awards; The Dutch Design Award; Print Magazine’s awards; The Aquent Design Award and many others. Atrissi was twice nominated for the Jameel Prize Award by the V&A Museum in London. He was selected in 2005 for Print Magazine’s Twenty under Thirty, the international review for the most achieved visual artists below the age of 30. Tarek Atrissi has also served as a jury member for international design competitions including TDC in New York; Magdalena Festival in Slovenia; the Adobe Design Achievement Awards in California; as well as the Tehran International Type Design competition in Iran. 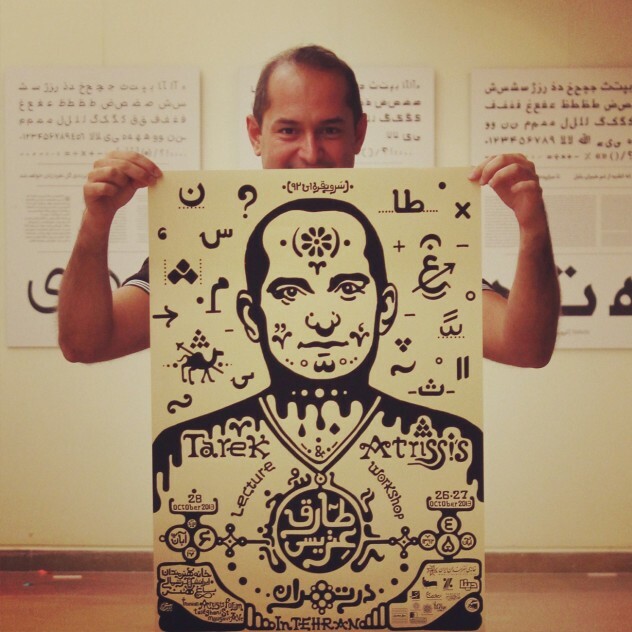 Above: Tarek Atrissi in Iran, honoured by the invitation from the Iranian Graphic Design Society in 2013 to conduct a workshop; give a public lecture; be part of the first international Type Design competition; and to exhibit his type design work at a museum in Tehran. Poster promoting Tarek Atrissi’s visit to Iran by the Iranian Graphic Design Society. Tarek Atrissi’s work has been exhibited in many international design exhibitions, including two solo exhibition: the first at the VCU Qatar Gallery in Doha, and the second in Amsterdam at De Levante foundation in Amsterdam, the Netherlands. In 2006, he was invited by MoMA- the Museum of Modern Art New York- to be part of the Graphic Design symposium addressing the museum’s Graphic design collection. 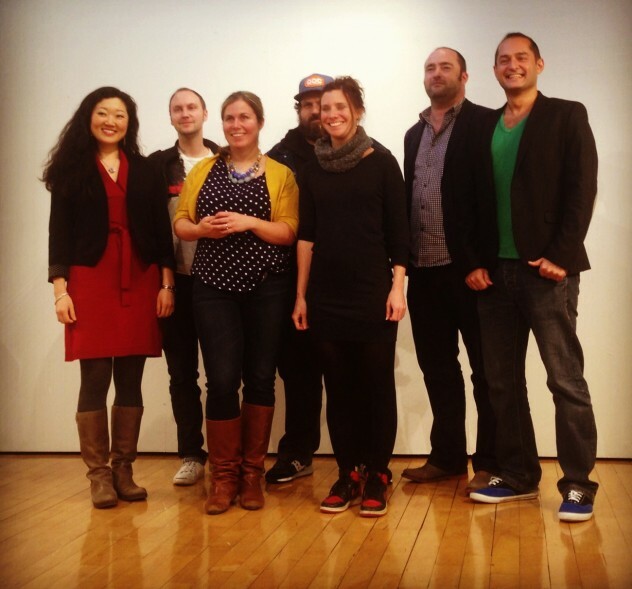 Above: Tarek Atrissi as a jury member of the prestigious TDC annual Communication Design competition at the Type Directors Club in New York, 2013. – Added to the School of Visual Arts’ noteworthy alumni list, a list that includes a selection of the university’s prominent graduates in a broad range of creative disciplines. August 2014. Read more. – Invited as a special guest critic for the School of Visual Art’s Masters workshop in Rome, Italy. June 2014. – Selected as a jury Member of the TDC Annual Communication Design Competition by invitation from the Type Directors Club in New York, 2013. – Selected as a jury member for the International Type Design Competition in Tehran, Iran, by invitation from the Iranian Graphic Design Society, 2013. – Nuqat Conference appreciation awards. Kuwait 2012. – Gouden Apenstaart 2011 for “Het Klokhuis” website. (Tarek Atrissi Design part of the design team taking part in the website design). – Solo Exhibition, Amsterdam, Stichting De Levante: “Arabic Graphics: The work of Tarek Atrissi in Exhibition”; 2008, The Netherlands. – Dutch Design Award 2007 for El Hema Project in Category Visual Identity- Logo for El Hema designed by Tarek Atrissi. – Print Magazine- Selected for 20 under 30, annual review of the youngest most achieved Visual artists- USA, 2005. – Selected as a jury member for the Magdalena Festival in Maribor, Slovenia, 2004. – Step Magazine, USA- Selected as one of the fastest rising 25 design stars for 2004. – Aquent Design Award. New York, USA, 2003. – The Type Directors Club, award of typographic excellence- New York, USA, 2003. 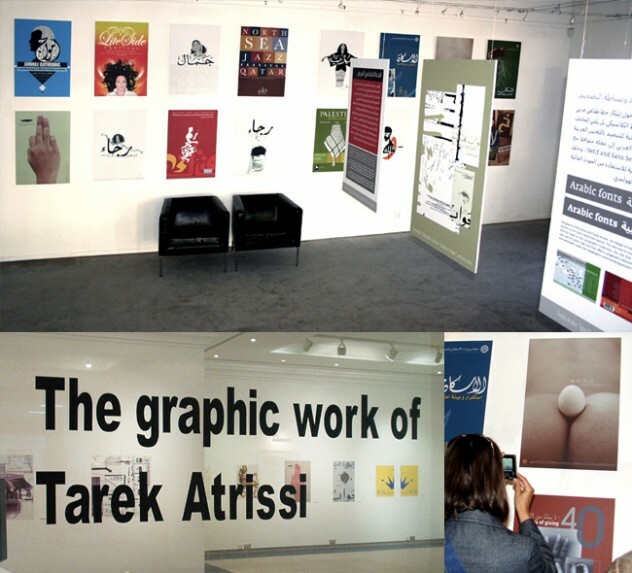 – Solo Exhibition, VCU Qatar: “The graphic work of Tarek Atrissi “; 2003; Doha, Qatar. – Adobe Achievement Design award- First prize, Print Category. New York, USA, 2001. – Adobe Achievement Design award- Third prize, Web Category. New York, USA, 2001. – Work included in the permanent design collection of the Bibliothéque National de France in Paris. – Work included in the design collection of the University of Amsterdam, the Netherlands. – Work, interviews and articles published in major international design publications; for a comprehensive list see the press section of this website. – Work included in many group exhibitions around the word; including exhibitions at the Guggenheim museum in New York; At the Islamic world economic Forum in Malaysia; and at the American University of Beirut; among many others. – Alumni Scholarship Award. SVA, New York, USA, 2003. – Step Inside Design student award, USA, 2002. – Winner of the SURF logo design contest. United Nations, SURF’s Caribbean office, 1999. – IBDAA99 awards [Creative99]. Open Design competition for professional designers in the Arab world: Four awards including packaging, print, 3D Design and poster awards, 1999.